Last weekend I did my first Wedding Show, which was fun and exhausting in equal parts! One of the interesting things that came out of speaking to all the lovely brides was a feeling of environmental awareness in relation to flowers. Many people didn’t feel comfortable ordering flowers that would only be used for one day and then thrown away. I am very interested in this side of floristry and want to try to minimise my footprint by using seasonal blooms, environmentally friendly or traditional practices and, where possible, British flowers. However it has also occurred to me that some of the designs I’ve been working on recently such as terrariums and living wreaths might also make great table centres and decorations at weddings, which will then keep on living. 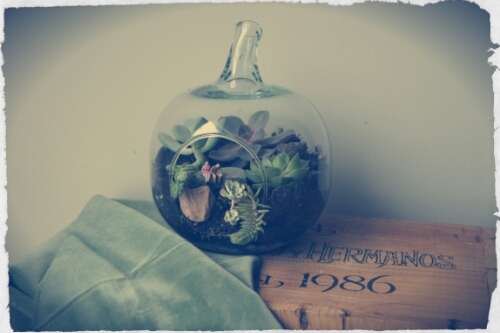 Terrariums originated from a period when plant hunters transported living specimens thousands of miles home from their exotic adventures overseas. The plants were placed in glass containers that provided a self-sustaining mini-environment in which moisture created by the plants collected on the inside surfaces of the glass and dripped down to rehydrate them. Wardian cases became a fashionable way for wealthy Victorians to display indoor plants. This was especially key in Victorian cities where pollution made gardening a no-no. In recent years they have taken the North American and Australian interiors scene by storm, however in Britain they are still relatively unusual. I loved the idea of making these little self-contained worlds and have been working on a variety of designs in interesting containers to sell at a Vintage market I will be at this weekend. Other designs I’ve worked on include two series of “living wreaths”. The first is made using the amazing Tillandsia or “air plants” which originate from the jungle and so take all their nutrients from the air. These fascinating plants can live just about anywhere and require very little care from you, just occasional misting with water. I love the lines they create; they look out of this world! Finally I am also working on some living wreaths and letters using succulents, ivy or seasonal plants such as the pansies I’ve put in these letters. They are a great way of including a quirky monogrammed feature in your home or at a wedding, or could equally be used at a grave to last much longer than a traditional oasis wreath. Looking after any of these designs is so easy even the least green-fingered person could manage it, I really hope people love these ideas as much as I do, house plants don’t have to be boring!